Oscar Pistorius' murder case took a sensational twist Thursday when it was revealed that the chief investigator who analyzed the scene of Reeva Steenkamp's fatal shooting faces seven counts of attempted murder charges himself. Hilton Botha, whose stumbling and at times incoherent evidence on day two of Pistorius' bail hearing gave the Blade Runner's case a serious boost, was allegedly one of three drunk police officers who opened fire on a mini-bus taxi full of passengers in 2011, according to South Africa's Eyewitness News. According to Botha, the shooting took place as part of the investigation into the murder of Denise Stratford, a Girl Scout leader whose body was discovered stuffed into a drain in 2011. Botha and colleagues were tracking the suspect and as part of their inquiries fired at the mini-bus when it failed to pull over when requested. Botha was arrested at the time due to the charges, which were subsequently dropped, before it emerged Thursday that they had been reinstated. "There was a decision taken by the director of public prosecution's office to charge the members, each one of them, with seven counts of attempted murder," said police spokesman Neville Malila. "That was the number of people that were in the taxi." Botha denied he was drunk during the alleged incident and told South African legal journalist Karyn Maughan on Thursday morning that the reinstatement of the charge is "beyond my comprehension." "I can only think it is linked to my work on the Oscar Pistorius case," he said. In a statement, however, the South African National Prosecuting Authority revealed the murder charge against Botha was reinstated before the Pistorius incident, reportedly as early as Feb. 4. 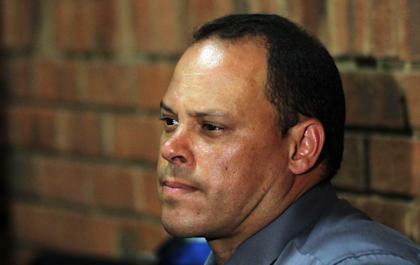 Botha insisted to the media that he only learned of the reinstatement after the Valentine's Day killing of Steenkamp. According to Malila, Botha is scheduled to appear in court in May to face the charges. Thursday, Botha was taken off the Pistorius case. "If we have an investigating officer that is facing such serious charges, it cannot happen that he continues with this case," an NPA spokesperson said. Botha had become one of the major characters in the Pistorius case as it has unfolded with a bail hearing that stretched into a third day and resembled a mini-trial with detailed evidence being given from both sides. The reason for the elongated hearing is a product of both the vagaries of the South African legal system and the desire of both the prosecution and defense to gain a positive result on bail. During his testimony Wednesday, Botha unraveled under cross-examination from defense attorney Barry Roux, admitting that he couldn't find anything to contradict Pistorius' claim that he mistook Steenkamp for an intruder. Botha also opened himself to allegations he had contaminated the crime scene by revealing he had not worn protective shoes and was forced to admit one of his witnesses, a neighbor, was more than a quarter mile away from the scene. Yet his blundering under oath was nothing compared to the damage that Thursday's bombshell may have done to the case, with Botha's credibility as an investigator pivotal. Alex Eliseev, the Eyewitness News journalist who broke the Botha story, told 567 The Cape radio on Thursday that he contacted Botha following the publication of the report and that the senior policeman with 24 years of experience insisted the allegations against him were false. "[Botha] says he was involved in an absolutely legitimate case," Eliseev said. "He says they tried to pull over the taxi, they were not drunk, they shot at the wheels and tried to get it to stop. He thought the case had been withdrawn." The bail hearing continues Thursday.